Doomsday Preppers. Cannon balls. Gelatin facials. Daisy. And now that Sweets is moving out, Booth gets his tub back! 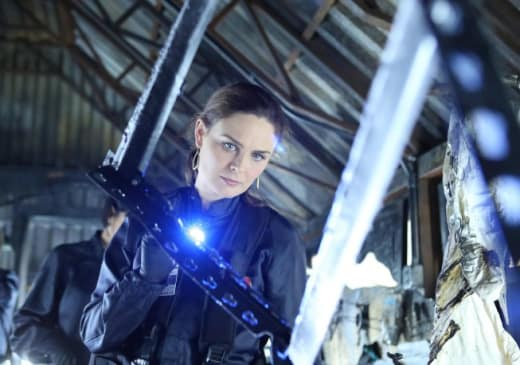 Tonight's Sweets-centric episode of Bones was a step up from previous weeks. "The Doom in the Gloom" was an entertaining hour in what has otherwise been an uneven season. The case of the week was the story of a Doomsday Prepper who was killed by a member of her group. Thankfully, what we didn't see was the team all deciding they needed to prepare for the end of the world. The case was just a case and there weren't forced parallels between the victim's life and theirs. This was a welcome departure from all of the "after school special" cases we've had this season and made this episode enjoyable. Nothing felt preachy or loaded with pathos. It simply let our team do what they do best: solve crimes while being witty and awesome. Hodgins and his experiments were great. Of course he knew that Angela's math was correct, but who doesn't want to take the opportunity to fire a cannon when said opportunity is presented, right? It was also a different turn to see Booth in the lab working an experiment of his own to determine how the booby trap used to kill the victim worked. I can't decide if Hodgins and Cam set Booth up or if Cam's opening the door at just the right time to splatter Booth in the face with the goo was circumstantial. Either way, it was fun. I didn't even find Daisy to be half as obnoxious as she usually is. Perhaps she took Cam's advice to stop copying Brennan to heart after all. She was just there as a background squint and champion for Sweets and it made her bearable somehow. And yet I fear that her defense of Sweets and their shared moment in the bone room is leading somewhere I would personally rather the writers didn't go--a reunion between Sweets and Daisy and a rekindling of their romance. Hopefully their conversation was just another nail in that coffin. Their ship has sailed. What's done is done. Insert another cliche' for breaking up here! And besides, Sweets is moving in with Janet and Chrissie, two hot psychiatrists, Three's Company-style anyway. Since four's a crowd, there's no room for Daisy anyway. It was funny to watch Booth and Bones have trouble kicking Sweets out of the nest. They really did seem like concerned parents so the "Mr. and Mrs. Sweets" at the end was fitting, and Booth and Bones took it in stride. Even though they know his moving out is good for all of them, they've grown attached to having him there, as has Christine. But, fly the coop Sweets must, and so he did. Their cohabitation was fun while it lasted. What did you think of "The Doom in the Gloom?" Did you find this to be a less cumbersome episode than those we've had recently? Bones: Certain is an absolute, Ms. Wick. You can't be mostly certain. Cam: Mostly certain's good for me. Cam: Found the head! In the toilet. Booth: Okay, that's a rough way to be remembered.